Two of Victoria’s leading human rights and justice organisations today endorsed calls made by the Occupy Melbourne Legal Support Team for an independent inquiry into the Occupy Melbourne eviction. The calls came on the back of the Support Team winning the prestigious Tim McCoy Award on Friday night, an annual Victorian award recognising outstanding achievement in human rights and social justice. 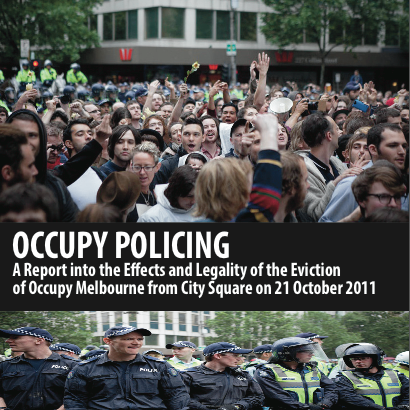 Liberty Victoria and the Victorian Federation of Community Legal Centres today welcomed the release of the Occupy Policing report and backed its call for an independent inquiry into the eviction of Occupy Melbourne protesters from City Square on 21 October 2011. ‘More than that, however, the information and evidence collected in the report suggests that the rights of demonstrators to freedom of speech and assembly may have been violated. These rights are protected by the Victorian Charter of Rights and Responsibilities and they are set down in the International Covenant on Civil and Political Rights, an international human rights treaty to which Australia is a signatory. In other words, both Melbourne City Council and Victoria police may have acted illegally and in breach of Australia’s international human rights obligations. Because of this, Liberty Victoria favours the immediate creation of an independent inquiry to examine all the circumstances in which the protest was terminated’. A copy of the Report has been provided to the Office of Police Integrity, the Honorable Peter Ryan, Minister for Police, Melbourne City Council and the Victorian Human Rights and Equal Opportunity Commission. To date, none of these individuals or organizations have acknowledged receipt of or committed to investigating the contents and findings of the Report. This entry was posted in #OccupyMelbourne and tagged #OccupyAustralia, #OccupyMelbourne, New South Wales by occupymelbourne. Bookmark the permalink.